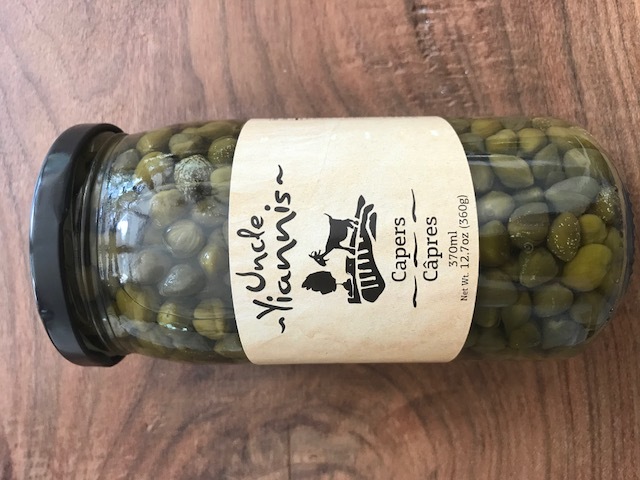 Really, you don't know what a caper is? She seemed to be around forty. Who could live that long and not have tasted this delectable morsel of food about the size of a small pea? So as a public service to all you caper novices out there, I will explain their regal status in my kitchen. 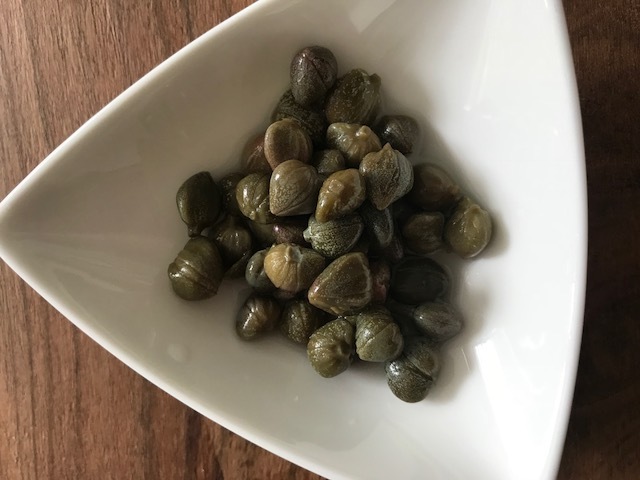 Capers can be traced to ancient Greek and Roman times. If a food item has been eaten for that long, you know it has staying power and is not simply a food trend like avocado toast. Although my daughter Dolly introduced me to avocado toast and I haven't looked back. The flower bud of the Flinders Rose plant, they are found in Mediterranean cooking and used to add tang to fish, pastas, chicken, tartar sauce and salads. I've been known to eat a spoonful right from the jar. The flavor is intense. It's salty, vinegary, tangy and adds so much depth to sauces. Most recipes call for rinsing the capers before using but I like that salty brine and don't bother. I would never dice them either. Too labor intensive and what's the point? I prefer it when they burst in my mouth and not all over the cutting board. Like Mirepoix in French cooking; onions, celery and carrots. 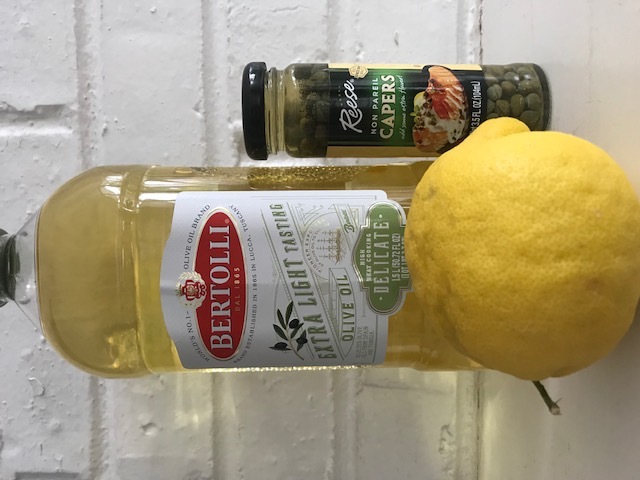 Or the Holy Trinity in Cajun/Creole cooking; onions, celery and bell peppers - my flavor Trifecta is olive oil, lemon and capers. You can't go wrong using this combination in pastas, chicken or fish dishes. Toss 8 oz. of your favorite pasta with a can of tuna. Zest and squeeze in a lemon. Salt and pepper, olive oil and a handful of capers. Top with shaved parmesan and you have a delicious, quick meal. It's even good cold the next day. Abhor tuna? Omit and just have the pasta. 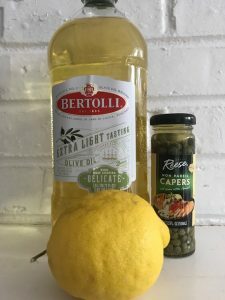 Try this recipe for chicken in a lemon caper sauce. Love salmon? Here is a recipe for salmon with lemon caper sauce. Add a tablespoon or two to a green salad or potato salad. You will taste a forkful and think, what's this spark of flavor I'm getting? My teeth just bit into divine bliss and I want more. An Everything bagel topped with lox, cream cheese and capers is the gold standard for a lazy breakfast. Smoked salmon and cream cheese is an easy appetizer that will become a go-to favorite. Add fresh dill if you're a fan. I use those tiny Party Rye breads you find in the deli department. 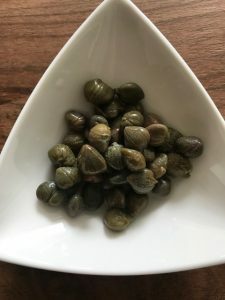 Capers are picked by hand so they can be a bit pricey. But a little goes a long way so it's worth the expense. 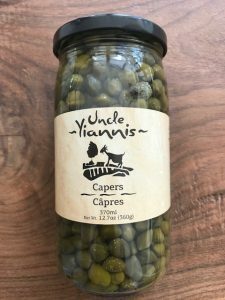 Pick up a jar of capers the next time you are grocery shopping. You will find them in the pickle aisle.